Being a food blogger is so cool. Seriously, it’s probably one of the best things ever. Food is something that’s so universal; anyone can connect over a shared love of a certain dish or recipe. And as a food blogger, when someone likes your recipes, it is the BEST FEELING EVER. So the other day, I got a message on my facebook page from a reader, who is a diabetic and a vegetarian trying to go 100% vegan. She wrote that she was having a hard time finding breakfast recipes that were high in protein, but still low-glycemic AND vegan. 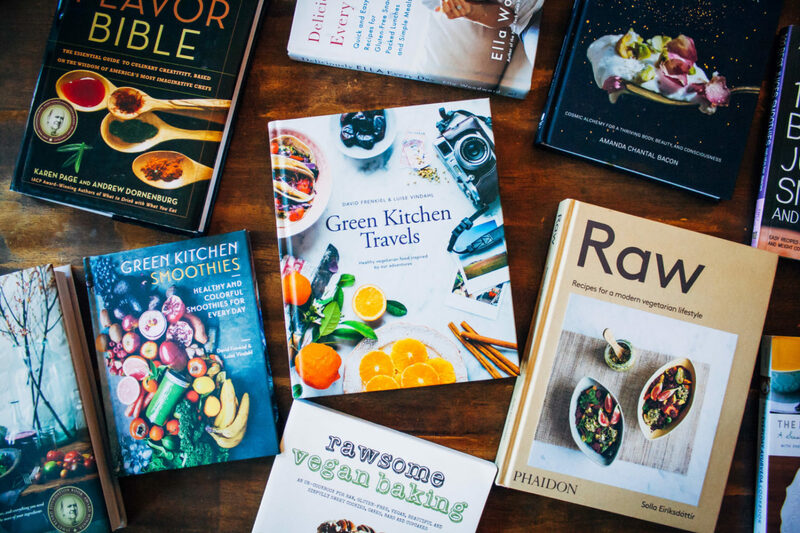 I couldn’t think of any recipes off the top of my head, but I knew that I really wanted to create something amazing for this reader. I immediately went on a google rampage to research ingredients (one of my favorite side hobbies) and started to formulate ideas in my head. One of my first thoughts was quinoa – something that is lumped in to the “whole grains” category (thank you, marketing) but is actually the seed of the chenopodium quinoa plant. Quinoa is a very interesting little pseudocereal because it contains all nine essential amino acids that our bodies can’t synthesize themselves. In addition, it has a very low glycemic load of 18, meaning that it won’t cause a significant spike in blood sugar. Score!! 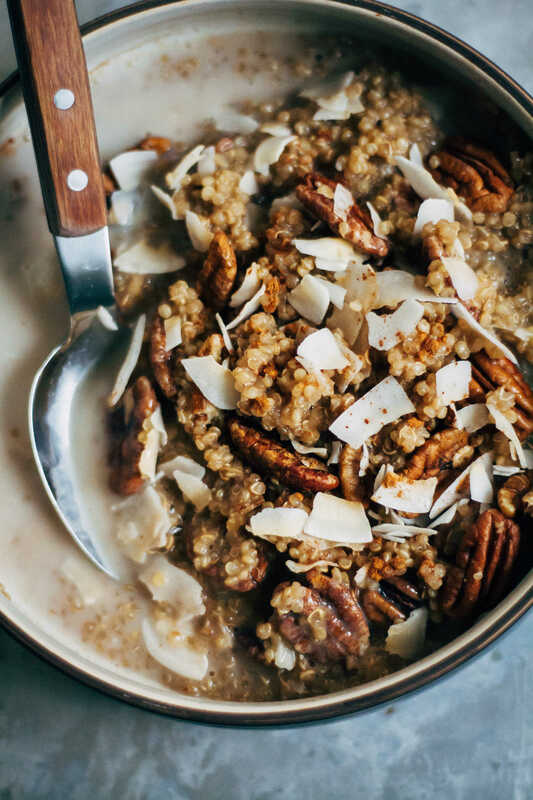 In this recipe, the quinoa is cooked in unsweetened almond milk steeped with chai tea (yum! ), then topped with pecans and coconut for protein and a little cinnamon for flavor. 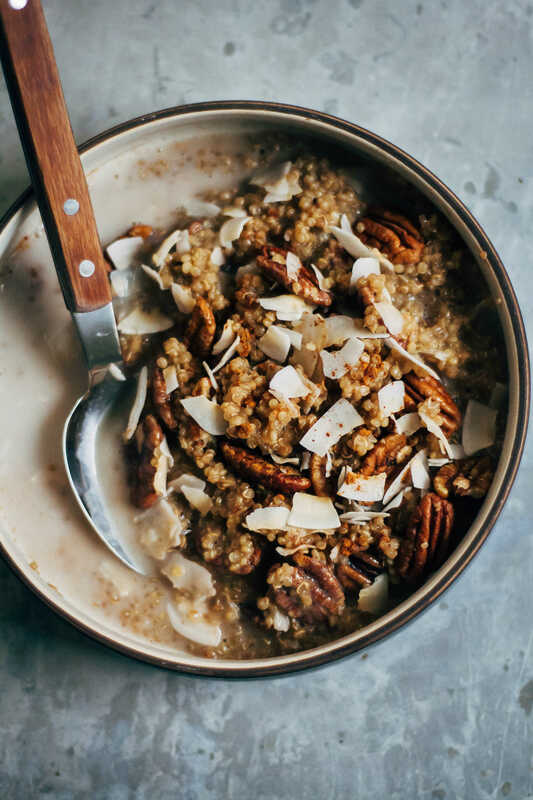 The quinoa can be served with more warmed almond milk, or even this homemade pecan + walnut milk! It’s low-glycemic, nutritious, and a pretty darn delicious breakfast if I do say so myself. To all of my readers – I hope you enjoy this recipe! This breakfast quinoa is high in protein but low on the glycemic index! Before cooking, be sure to rinse quinoa well. This removes saponin (quinoa's natural coating), which can make quinoa bitter. In a small saucepan, combine almond milk, quinoa, and chai tea bag, and bring to a boil. Once almond milk is boiling, remove the chai tea bag. Add coconut sugar (if desired) and stir. Reduce heat to a simmer and cook quinoa, covered, for about 15-20 minutes. When quinoa is done, remove from heat and keep covered for another 5-10 minutes so almond milk can fully absorb. To serve, put quinoa in a bowl with a little more warmed milk. This pecan + walnut milk would work amazingly as well! Garnish with pecans, coconut, and a sprinkle of cinnamon. receiving a feedback from your readers is the best feeling ever and only food blogger who creates their recipes will understand!!! yayy for the chai spiced almond milk. This looks like the perfect way to begin the day! Absolutely wonderful! Quinoa is always a wonderful way to wake-up <3 So nourishing! I have yet to try quinoa for breakfast, but you’ve convinced me! This loos like the perfect comforting fall breakfast! Oh my this dish looks absolutely delicious! I will really have to try to make this. 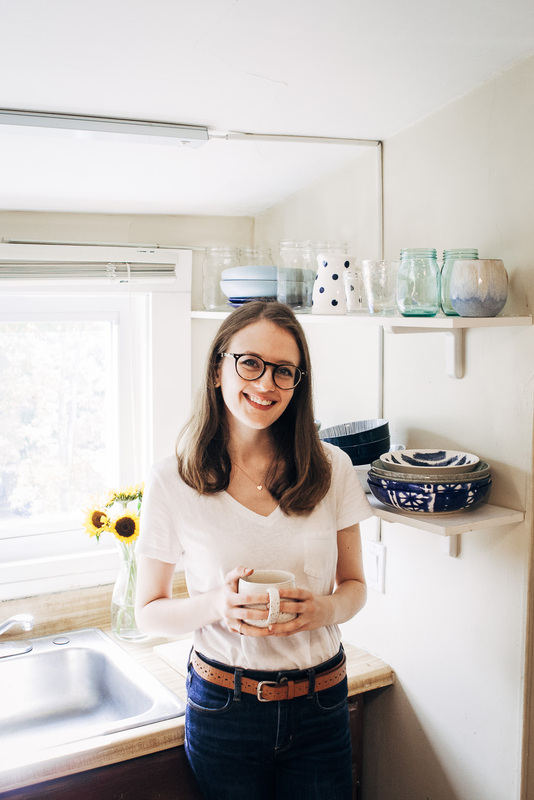 So glad to have found your blog- it is full of so many incredible ideas for cooking! Sarah, this looks so yummy! It reminds me of something I buy from a local vegan restaurant near my work…on those mornings when I should have made something for myself, but I hit snooze a couple too many times (oops). Your idea about infusing it with chai tea is a splendid one! I definitely need to try this! This is so beautiful I want to plant my face in that bowl! This looks amazing! Love breakfast quinoa and I will totally recommend this to my diabetic patients!! Your photos are just stunning! Thanks for the wonderful recipe and inspiration. This looks awesome! I ordered the ingredients in an online shop but they substituted quinoa for bulgar wheat which I hadn’t realised..would that work? :/ bulgar wheat is savoury to my mind! I might introduce my toddler to quinoa by using this recipe. Since it looks so much like oatmeal, she might be open-minded. Thanks for the good idea! Chai and quinoa, two of my favorite things! This sounds amazing! What a great breakfast idea! This looks delicious! I’m excited to try it!! I made this yesterday and it was delicious! Great suggestion with using chai tea. I used a coconut chai tea bag and used the milk for my overnight oats! This was an absolutely delicious way to start my day. I just finished my bowl, and I’ve already passed the recipe on to friends. Thank you for sharing. I look forward to trying more of your recipes. I’m so glad you like the breakfast quinoa, Paula!! I hope you like the other recipes too :) Happy Holidays!! I tried this today and it was the absolute best. I replaced the pecans by almonds because I didn’t have them and I added a banana instead of coconut, but it was still sooooo good. It was also very filling, which is great beause I’m always ravenous in the morning ! Made this today, but definitely did not look as good as yours! haha, i dont usually have quinoa for breakfast so its a nice change. Still love the thickness of my oatmeal in warm milk though :) thanks for sharing the recipe! Hi Sarah, I came across his recipe when searching for a way to make rolled quinoa into a tasty brekkie. I bought rolled quinoa and cooked it like I normally cook my oats (just with milk) and it was inedible! I can’t seem to find any brekkie recipes that use rolled quinoa but I’m not ready to give up on it that easily! Do you think this would work with rolled quinoa or do you have a suggestion around how to adapt it to work with rolled quinoa?